Though we’ve been thrilled about McFall Elementary adopting Sing Song Yoga for kids school-wide 4 years ago, I had not yet met or even connected with any of the teachers. So to meet Jasmine Koster, a kindergarten teacher at McFall, and find that she and her students were truly finding such rich purpose in using our kids’ yoga program in the classroom, was not only affirming for my business, but heart-warming personally as well. Below is the interview on Fox 17, during which Jasmine talks about using our kids yoga program in her classroom and throughout her school. She discusses the benefits she sees with her students as well as the overall effects on her classroom environment. The dialog from the video is also transcribed below. 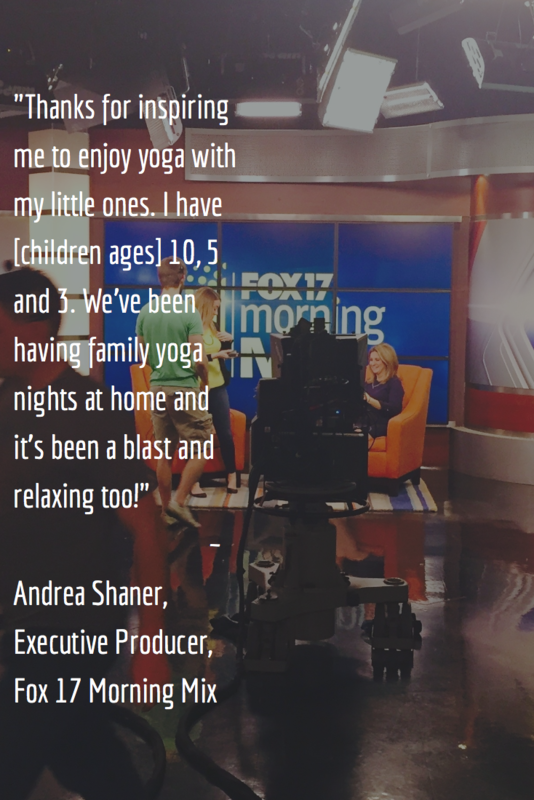 Leigh Ann Towne, Host of Fox 17 Morning Mix: How did you come up with Sing Song Yoga for kids? Deb Weiss-Gelmi, Sing Song Yoga founder: When my daughter was preschool age I was looking for a local [kids’] yoga class or a DVD and found neither at that time. So as a school teacher who used music in the classroom and as a yoga instructor this idea came to me. Leigh Ann: So explain to people what Sing Song Yoga is. Deb: Sing Song Yoga is a kids’ musical yoga program in which song lyrics instruct children how to get into the poses. Educational researchers find that music, movement and fun together naturally increase the positive chemicals in the brain that help with memory, with the ability to pay attention and with new learning. In other words, children respond really well to music which makes learning yoga or anything easier, more effective and more fun. Leigh Ann: How can viewers find out more about [Sing Song Yoga for kids]? Deb: We have local classes, a DVD, a book about yoga in the classroom and an App. The app is completely customizable. 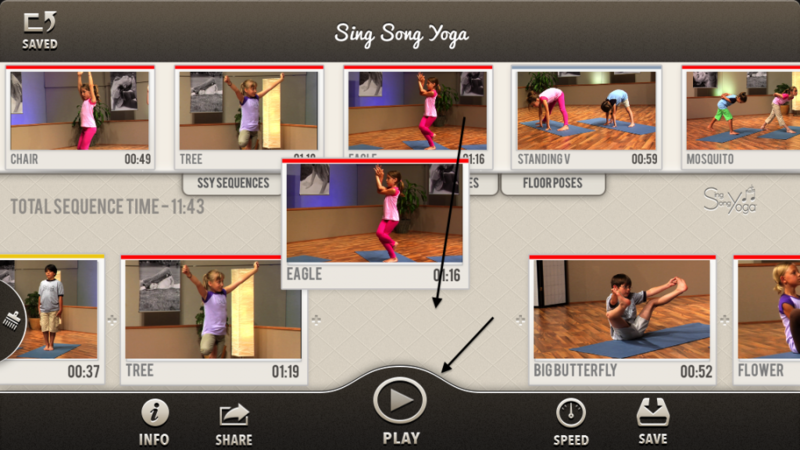 You can choose poses and create your own yoga sequence. Or you can choose from one of 39 preprogrammed sequences each with an end in mind. If you have a child at home who has a difficult time going to sleep – we have a bedtime sequence. If you have a child who does sports there’s an athlete’s sequence. If you’re a teacher you could choose one of the brain break sequences or test prep sequence. These are just some of the examples but we have 39 different possibilities and as I mentioned you can also create name and save your own yoga program. And we have a unique feature inspired by a parent of a child with physical limitations. She kept having to pause our DVD for extra time to transition between the poses. So with our app you could have a transition as quick as 1 second for the young energetic users or as long as 30 seconds for those who need a bit more time. Leigh Ann (to Jasmine): Now you are a teacher right now. Where do you teach? 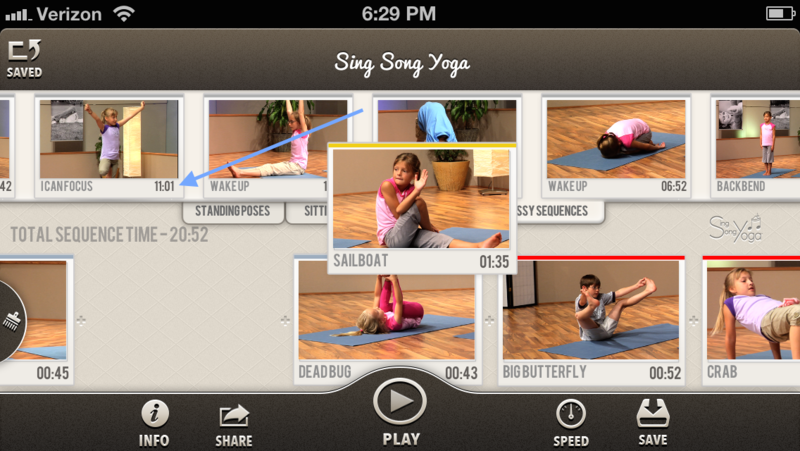 Leigh Ann: How did you discover Sing Song Yoga for kids and how do you incorporate it into your classroom? Jasmine: I started Sing Song Yoga about 4 years ago. It’s been a great way for me to combine my two passions which are also yoga and teaching young children. 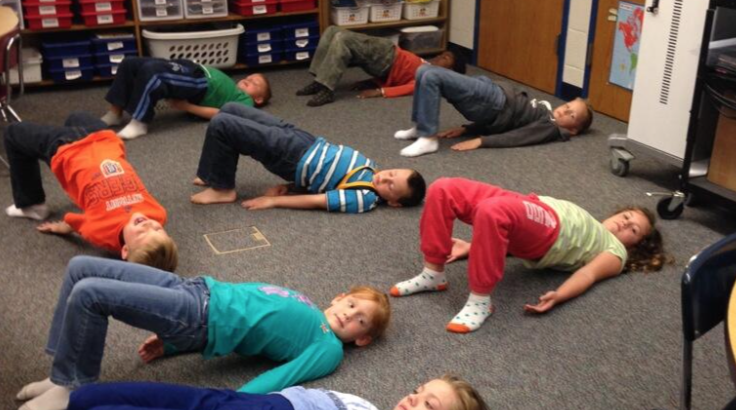 I love to use yoga in our classroom to create a sense of calm. I feel that any amount of time we put into a yoga session is definitely gained back in our classroom work. My students are always refocused, their concentration improves, we have a sense of calmness in our classroom. And so it’s not only been a way to sharpen ourselves physically but also mentally as well. Leigh Ann: How many times a week do you incorporate it? Jasmine: I try to use it once or twice a week and incorporate it into our lesson plans. And the majority of our school teachers in our building also try that as well. So it’s been something we’ve all enjoyed incorporating and making fit into our very busy schedule. Leigh Ann: What’s the reaction been like for the kids? 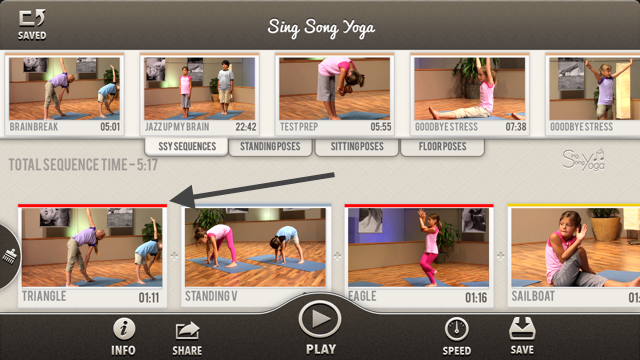 Jasmine: My kids love to do Sing Song Yoga. They request it. They are actively engage while participating and the greatest thing I love about it is that they encourage each other while we’re doing it. So they’s also establishing a wonderful emotional connection with each other as well. Leigh Ann: How might teachers get their hands on Sing Song Yoga? Deb: The app is very user-friendly so a teacher could download the free version of the app and give it a shot today! It’s airplay enabled and can easily be projected onto big screens in the classroom. 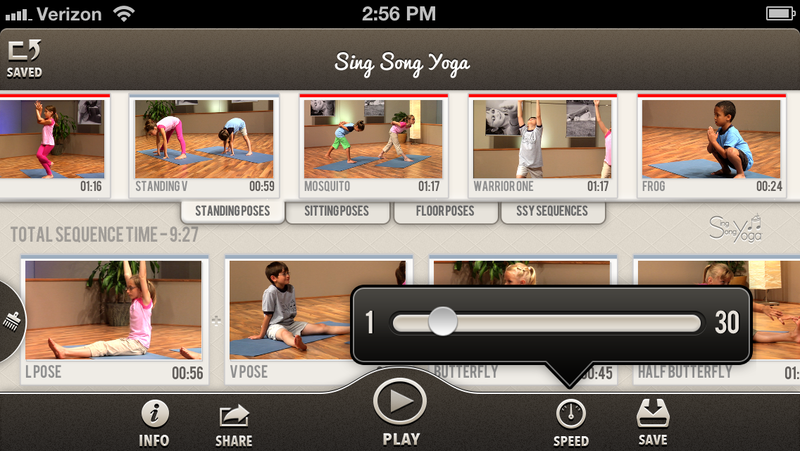 We have a book: Using Sing Song Yoga in the Classroom, which includes a DVD and 19 lessons. We also offer a professional development to assist teachers and schools in getting the most out of the app, how to squeeze yoga into the busy school day (which is always a challenge) as well as information on the benefits of yoga for kids. Leigh Ann (to Jasmine): Now this isn’t taking the place of recess is it? You’re still allowing them to wind up and then wind them back down, right? Jasmine: No. I actually like to use it as a transition from one lesson to the next to reestablish their self-awareness. So it’s been a great tool in our classroom. Leigh Ann: For more information head to singsongyoga.com, Facebook, Pinterest and Twitter, @singsongyoga. And there are 5 free Sing Song Yoga classes at the Grand Rapids Public Library on July 19 and 20? Deb: Correct. As part of their summer reading series. You can also find us at the Yoga Studio in Grand Rapids, gryoga.com and through Zeeland Recreation. 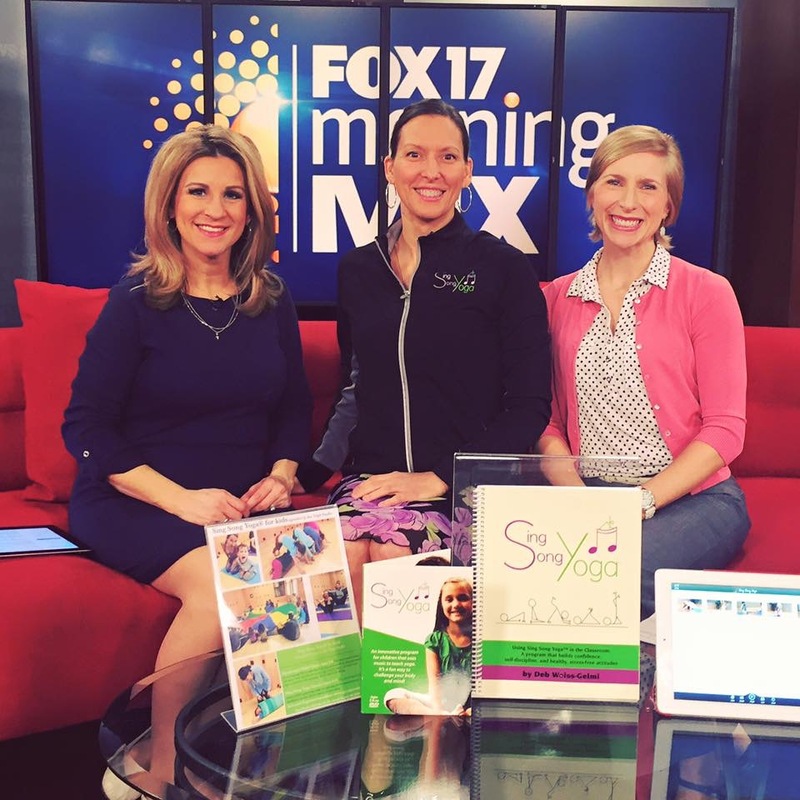 Thank you sincerely to Executive Producer, Fox 17 Morning Mix, Andrea Shaner and host of Morning Mix, Leigh Ann Towne for featuring Sing Song Yoga for kids on your show! And thank you to Jasmine Koster for joining me in sharing our mutual passion, respect and appreciation of yoga for kids! I truly appreciate such a rewarding experience! 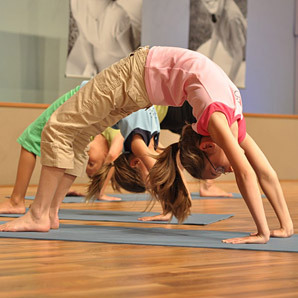 8 Kids Yoga Myths Some common misunderstandings about yoga for kids. This entry was posted	on Tuesday, March 15th, 2016. Posted in Education, Kid's Yoga Sequences, Kids Yoga at Home, Sing Song Yoga, Uncategorized, Yoga in Schools. 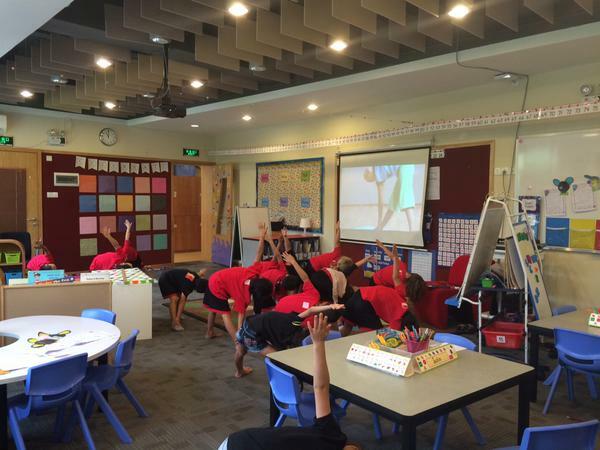 Thank you fabulous young yogis and your brilliant teacher, Mrs. Johnson, in China for this great #SSYkidQuestion!! We so appreciate you tweeting us questions and inspirations for other kids and their parents and teachers! So, first things first — in yoga and in any other area of life… where you are is exactly the perfect place to be! Really!! And if you would like to change something, “where you are” is the perfect place from which to start. For example, if you want to touch your toes in ragdoll (uttanasana), but right now you can touch your knees, first say to yourself “I can touch my knees today. I wonder how far I will reach in a month after doing yoga regularly.” You are where you are and there is nothing better than that! Celebrate today and move forward from here! 2. There’s only one person to compare yourself to… and that’s YOU! – not anyone else. Comparing yourself to someone else is like comparing the ocean to the forest. Each person is beautifully unique – thank goodness for that – and comparing yourself to another person helps no one. On the other hand, look at yourself today compared to yourself… say last year at this time… You have most certainly come a long way. Celebrate that! Always compare yourself to only you and you will see growth! Regarding yoga poses and stretching farther, try this. Do a yoga pose that you enjoy and in which you would like to stretch farther. For example, (and maybe as a group) do the L Pose (Dandasana/Paschimottanasana), hold it for a moment while you notice where your fingers land on your legs. Maybe note this on a sticky note (Deb – Sept. 2 – L Pose – finger tips at knees) and put it away. Then, a month or so later, do the same thing and just notice if your fingers land in the same place on your legs or maybe just a touch farther – and note that. If not this month, maybe next month. Either way, yoga is not about how flexible you are. It does tend to increase flexibility but it is not the most important part! Be aware of your body and how magnificent it is and what it can accomplish for you!! If you’d like to increase your flexibility one strategy you can try is to hold some poses longer than we do in the Sing Song Yoga videos. Maybe as a class, you can decide a pose for the month to hold longer during your yoga time. For example, for the month of September, each time we do yoga let’s pause the video and hold Standing V (Upavistha Konasana) longer. Maybe the class could vote to select the pose each month. 4. Do a sequence of poses working the same muscles/muscle groups. Several yoga poses use similar muscles to do the poses. For example, hamstrings (those muscles on our back thighs) are lengthened within many different poses. And they are often tight and a main factor in how far we can bend forward — as in Rag Doll (Uttanasana). If we were to just hold Rag Doll for 12 minutes, most of us would get bored. But, if we were to do several different poses within those 12 minutes that each focus on lengthening those hamstrings, we would not only better achieve it, but we would add in additional benefits from the other poses as well as enjoy the variety. That’s 10 poses in under 12 minutes, when you slide the transition speed to the left (see pic). Do yoga more often… even while watching TV 🙂 If there is a pose you’d really like to improve, set a goal to try to do that pose every day. If I wanted to reach my toes in L Pose, I could try to sit in this pose each day whenever I think of it… while reading, while watching TV, while chatting with my friends, etc. In the classroom, as a class, you could decide to sit in L Pose for a bit while you are studying your spelling words, or doing math flash cards, or reading… the possibilities are endless! The main thing to remember is to be easy about all of this and have fun! Thank you once again for your great question Mrs. Johnson’s #1stgradeyogis in China!! Please keep us posted on your yoga progress over the coming months! And of course, send new questions as they arise! Happy Yoga! This entry was posted	on Tuesday, September 1st, 2015. Posted in Kid's Yoga Sequences, Kids Yoga at Home, Sing Song Yoga, Yoga in Schools. 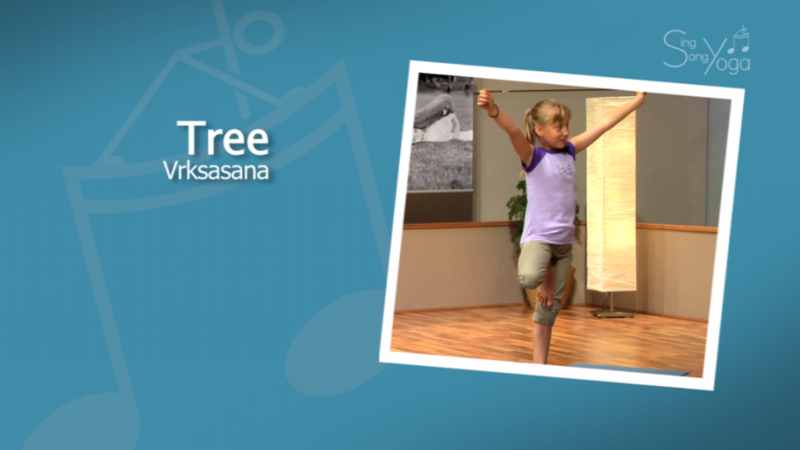 Last week we answered a great #ssykidquestion about Tips for Balancing in kids yoga poses. 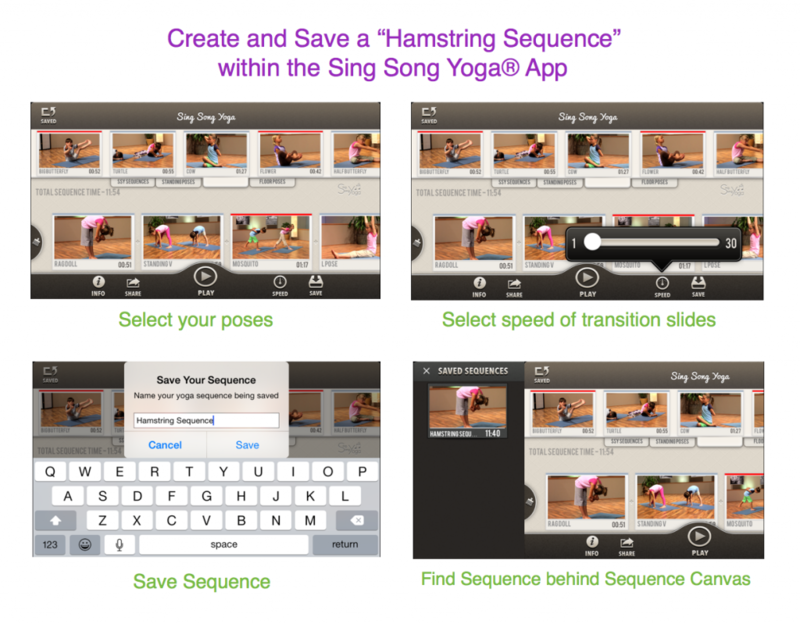 So, here is our follow up on how to build and save a balancing sequence within the Sing Song Yoga Kids Yoga App. The pics below make it easy cheesy for kids and their parents/teachers to create their own sequence! Go through the SSY App and find the balancing poses that you’d like to include in your sequence. These can be found under the tabs entitled Standing Poses Sitting Poses, and Floor Poses. 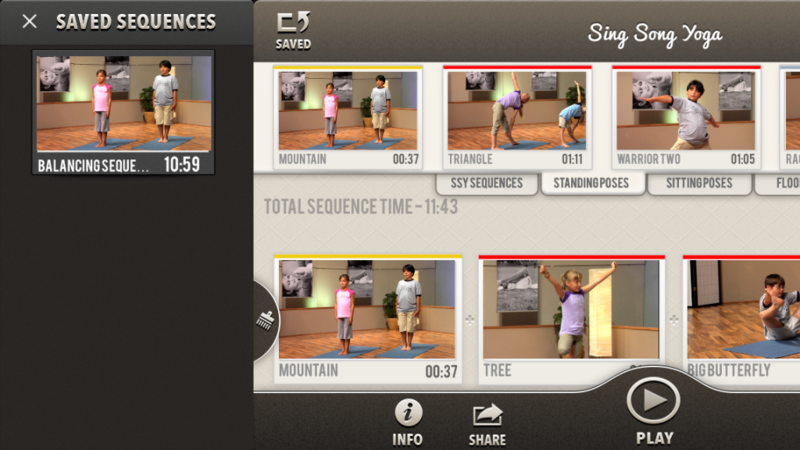 When you find each pose, press, hold and drag it to the Sequence Canvas. Notice the Total Sequence Time accumulating on the main screen to be sure it stays within your needed period of time. 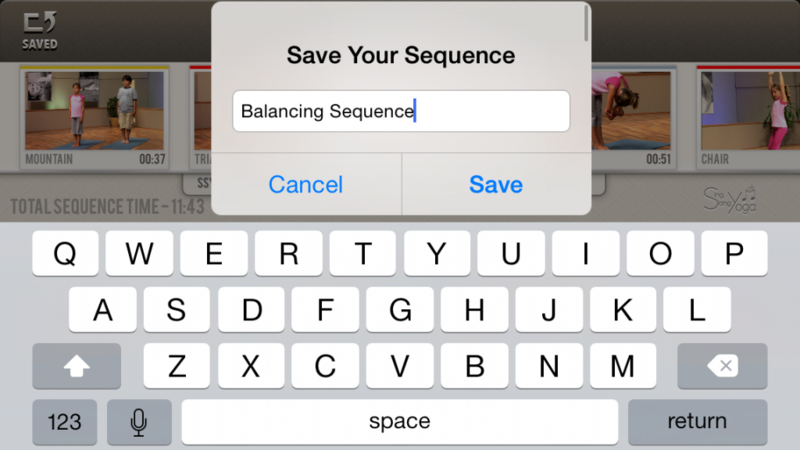 Save your Balancing Sequence by pressing the SAVE button below the Sequence Canvas (on the bottom of the home screen). Find your saved sequences behind the main screen by pressing the SAVED icon in the upper left corner of the screen. Have fun balancing with your kids! calming poses (ending… Savasana is most often the last pose). Thank heaps!! We can’t wait to hear from you! This entry was posted	on Saturday, November 1st, 2014. Posted in Kid's Yoga Sequences, Sing Song Yoga.